This fun photograph was taken in the entrance driveway of Carlyle on the Green, the amazing catering venue located at Bethpage State Park in Farmingdale, Long Island. This is just one of the spectacular venues that are owned and operated by the Carlyle group. The others are Carlyle of Lawrence, Carlyle at the Palace in Plainview, NY and Carlyle at the Omni in Uniondale, New York. As you can well imagine, my thirty plus years as a wedding photographer has afforded me the opportunity to work with the Carlyle folks on many occasions. 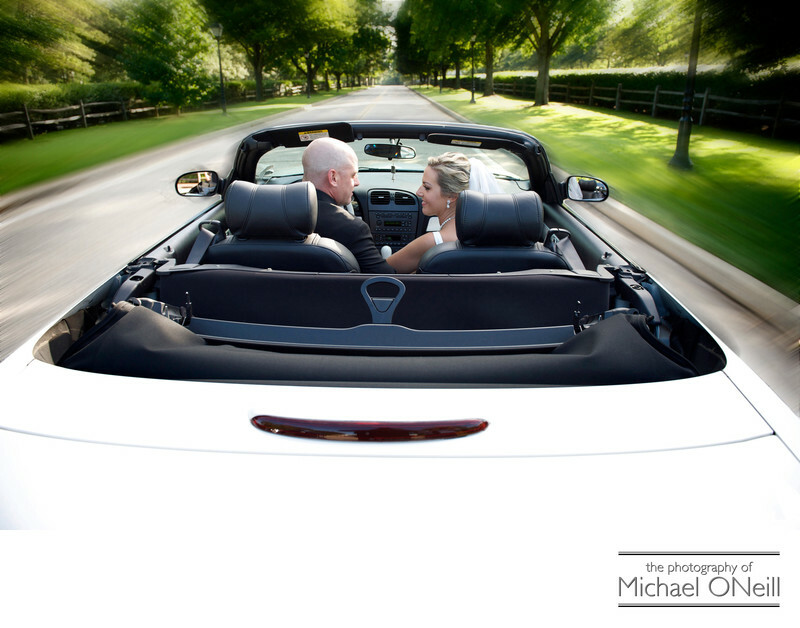 If you have chosen one of their venues for your upcoming wedding rest assured that you have made a fine choice.The bride and groom wanted to incorporate their convertible automobile into their wedding day pictures. I took some typical shots of them posed in front of the car as it was parked in front of the clubhouse where their wedding ceremony and reception took place, but then I bounced the idea for this photograph off the playful bride and groom. They were all in and I climbed up on the back of the car and took this image as they "drove off" down the tree-lined driveway at the end of the big day.I love capturing the true spirits and personalities of the people who hire me to photograph the most important day of their lives. I feel it is not simply my job to document what happened that day, but rather to capture the true essence of my clients. To do so you must find out what is important to your customers and what "makes them tick". I will be the person you meet when you first come in to my studio and gallery to discuss your wedding. I will be the photographer who takes your engagement photos before the wedding day. I will be the photographer on your wedding day and I will be the person responsible for editing, retouching and enhancing your photographs as well as designing your finished bridal album. If you’re looking to have this kind of personal service and have a lot of fun making pictures on your wedding day, give me a call.